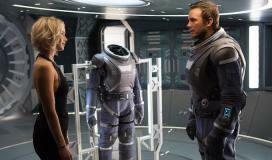 Morten Tyldum’s new film, Passengers is the best sort of science-fiction, one where it turns out the genre is irrelevant to the film’s theme. 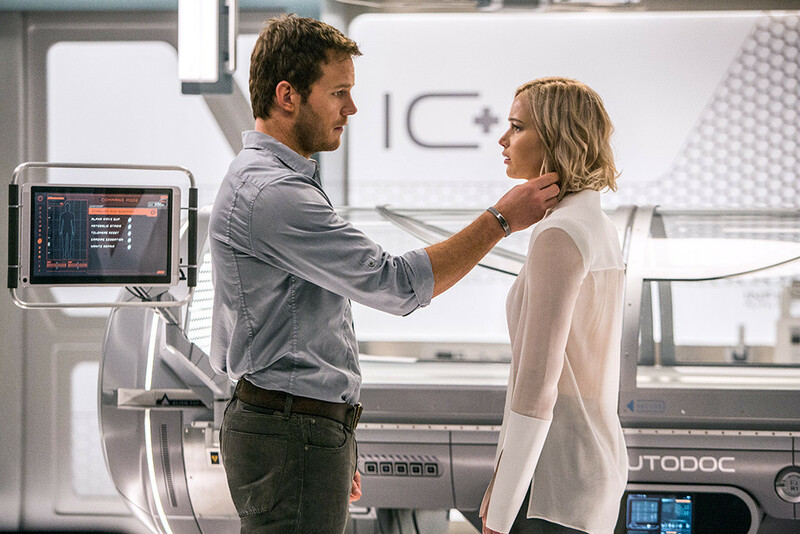 At its core, Passengers is a down-to-Earth melodrama, about the love two people find under the worst, most Existentially bleak circumstances. 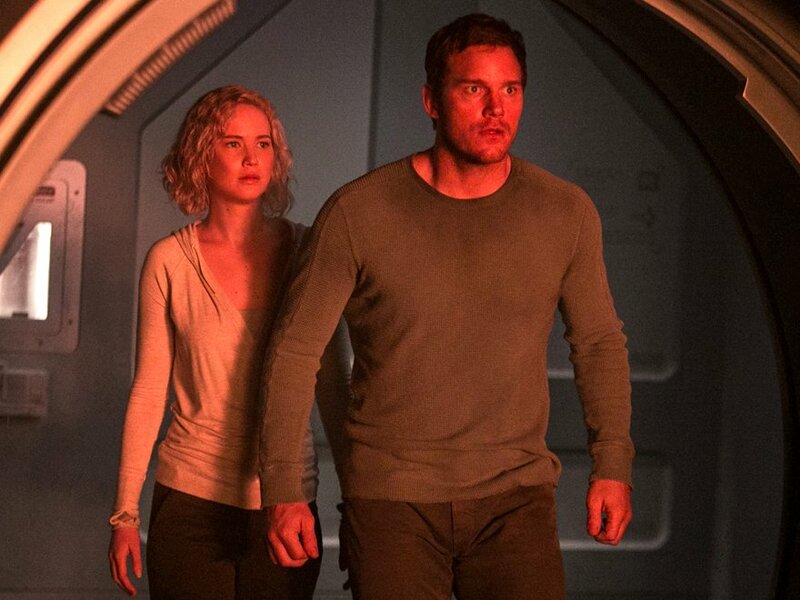 Passengers positions Tyldum as one of Hollywood cinema’s most promising filmmakers. His previous English-language film, The Imitation Game (2014), made after a full career in his native Norway, was similarly grounded in the stark reality of the world. That film found Alan Turing on a quest to use mathematics to help the Allies defeat the Nazi death machine, despite his own country’s policing of his sexuality. 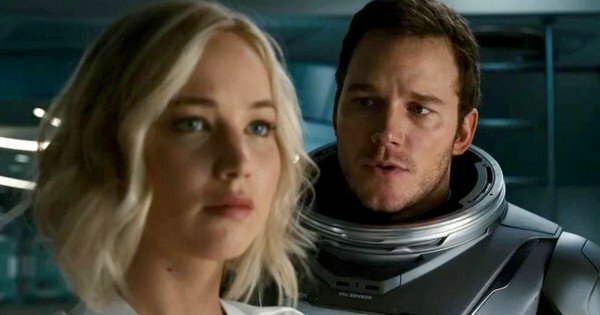 Passengers is an intertextually stunning film, deploying a series of references to science-fiction that we think will end up wallowing in dystopia. The film begins with mechanic Jim Preston (Chris Pratt) mysteriously awoken from suspended animation only 30 years into his 120-year long trip to emigrate to a distant colony planet, Homestead II. As Jim searches for the reason, he befriends the ship’s bartender, Arthur (Michael Sheen). In a set-up meant to mirror The Shining (Stanley Kubrick, 1980), Jim confides his darkest secrets, the primary of which is that, after struggling for over a year not to do it, he awakens Aurora Lane (Jennifer Lawrence), a journalist with whom he has fallen in love while she passively slept in her cryogenic pod. In Kubrick’s horror film, also about patriarchy and isolation, Lloyd (Joe Turkel), the bartender personification of the hotel, only seems to serve as a sounding board for Jack Torrance’s sexism, but ends up magnifying his discontent into a murderous rage. No such ill-will materializes in Arthur the bartender aboard the trans-galactic colony ship, the Avalon. At precisely the moment we expect the mechanical Arthur to be revealed as a malevolent tool of some horrid corporation, all is explained by Jim’s behavior. Arthur tells Aurora that Jim woke her up, but only because Jim accidentally tells him to. Arthur in fact follows Jim’s instructions to the letter to not tell her. However, when Aurora tells Arthur that she and Jim have no secrets from each other, Jim is forced to agree. At this point, Arthur reveals the secret. Rather than some evil hotel, or corrupt corporation, what reveals Jim’s lie is his own web of deceit, a completely uncanny explanation, devoid either of the marvelous or the fantastic, in Tzvetan Todorov’s semiotic terms for fantasy literature. The corrupt corporation we expect to be behind the malfunctioning of the space ship in Passengers never materializes, to significant thematic effect. The set-up mimics Ridley Scott’s horror film, Alien (1979). In that dark film, miners returning to Earth laden with valuable cargo are awoken early by a distress call from a mysterious planet. We later learn that the android accompanying the humans was acting in the interests of the mining corporation, who see in the aliens technology they might use for military purposes. Cynics conditioned by such science-fiction horror shows, we assume that the high-key lighting that dominates Passengers is the work of some ironic authorial force, to be pulled from under us at the second turning point of the film’s plot. Again, no such thing happens. The malfunction of Jim’s cryogenic sleeping pod is just that, an accident to the ship’s computer systems, caused by a collision with an asteroid. The accident serves a melodramatic purpose exclusively: the estranged Aurora and Jim have to work together to fix the ship. The most productive intertext for understanding Passengers is Wall-e (Andrew Stanton, 2008), Pixar’s film about a robot who has learned to love by watching Hollywood movies. Both films are set on long-distance space ships carrying precious human cargo, but both turn out to be about two lovers finding their humanity in each other. Aboard the Axiom, a ship meant to preserve humanity after the environmental destruction of the Earth, Wall-e (Ben Burtt) teaches what he has learned about love to Eve (Elissa Knight), a female robot programmed to find renewed signs of life on Earth so that the humans may return to the planet. In the most poetic of the film’s sequences, Wall-e takes Eve on a date outside the ship. As they jet around in outer space, they revel in the freedom of their new-found love. 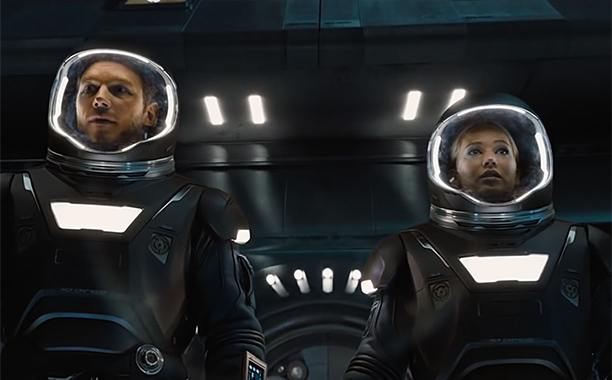 Passengers also features such a EVA sequence outside of the ship hurtling through space. After attempting suicide in the airlock, but abandoning his plan because of a lack of resolve, Jim wakes up Aurora. On their first date together, Jim takes her outside of the ship, tethered with a safety rope. Later in the film, Jim sacrifices himself to fix the ship from outside before it blows up. When his tether breaks, Aurora has to risk her own life to retrieve him, which she does. Passengers is filled, not with science-fiction clichés, but instead focuses on the ethical dilemmas of Existential art cinema, a tradition from which the Norwegian filmmaker Morten Tyldum emerges. Is Jim a morally corrupt character for having awoken and tricked Aurora into loving him? Does Sisyphus deserve fellow human contact as he suffers eternally? If Jim is indeed ethically lacking somehow, then all love back here on planet Earth is equally corrupted: we present ourselves to our prospective mates not as we really are, but as we hope they might see us to be. Is Aurora wrong to forgive Jim for the seemingly unpardonable sin of having woken her up 90 years early, thus condemning her to die out in the cold of space without any companionship other than his? If Aurora is in error, then all human forgiveness is inexpiable, since any commitment to others is an act of selfless sacrifice. The clearest contrast between Wall-e and Passengers involves the films’ endings. In Wall-e, the robots lead the humans from the Axiom back to the Earth, now that they have found a small plant sequestered in an abandoned refrigerator. In the end credits sequence, we see the progress the humans make reestablishing themselves on the planet. However, in the first twenty minutes of Wall-e, we witness the robot’s bleak existence weathering globally devastating storms. In all probability, there is no chance for humans who think pizza grows on trees to survive such an inhospitable climate. The denizens of the Axiom will surely be dead within the first few weeks of their attempted re-colonization of the self-protecting Earth. With no pretensions to an infantile audience, Passengers refuses to lie to us. We never see the Avalon arrive at its destination. Instead, we see the tree that Jim planted for Aurora early in the film having grown into an ancient oak in the middle of the ship, surrounded by overgrown and fecund vegetation. Aurora and Jim live out their life together, tending for ninety years to their sleeping colleagues, with whom they will never share experiences on the new world. Passengers suggests that the life of sacrifice lived with love between Jim and Aurora is just as meaningful as the one they would have lived on Homestead II, or back on Earth for that matter. Indeed, the film implies that the life they lived is the only possibility for fulfillment. The language of the film positions them in an obsessive number of two-shots, broken only when Aurora initially recoils from Jim’s betrayal of her, and when Jim must go outside of the ship to save them. In the Existential cold of space, Jim and Aurora find the only thing that properly sustains humanity, love. Passengers is a beautiful genre film of misdirection, teasing us with science-fiction intertexts, only to reveal to us the cinema’s primary function, to show how two people, flawed as we all are, can come to love each other as if themselves. It is a beautiful, important movie, far moreso than you’ve been led to believe. Todorov, Tzvetan. The Fantastic: A Structural Approach to a Literary Genre. Ithaca, NY: Cornell UP, 1975.